The saying goes that two’s company, and three’s a crowd. But when it comes to a football backfield, Pitt offensive coordinator Jim Chaney thinks otherwise. “I’m going to play everybody I feel like we can put on the field and win with,” Chaney said during Pitt’s training camp. 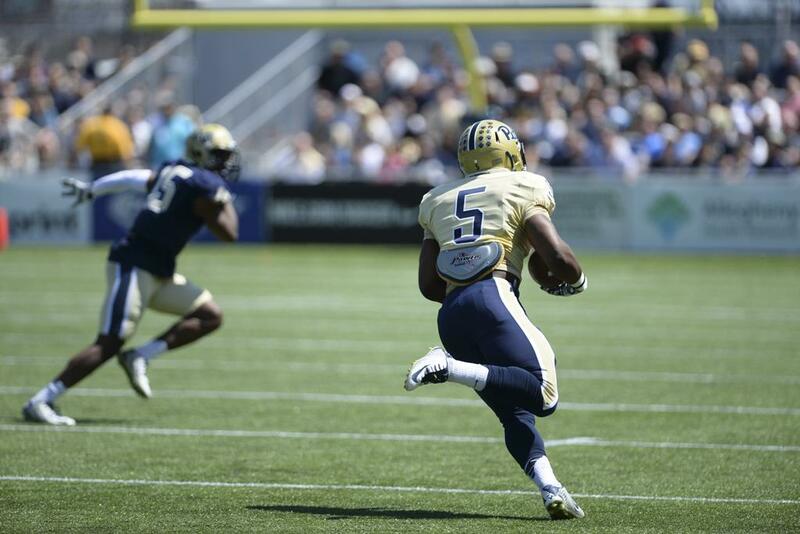 The idea of needing more than one running back may seem hard to fathom for Pitt fans. Incumbent starter James Conner had a monstrous 2014 season, winning ACC Player of the Year with 1,765 rushing yards and 26 touchdowns. But after averaging 6.7 yards per carry for the first 10 games of the year, Conner trailed off. In the final three games, including the Armed Forces Bowl against Houston, the junior’s production dissipated to a still-elite 4.9 yards per carry. Conner was simply beat up, according to Pitt running backs coach Andre Powell. “He took a lot of hits. You take five carries away from him every game and give those back in November, you’ll be a better football team,” Powell said. And with an early bye week and late matchups against divisional opponents Miami and Duke, as well as a strong Louisville team, a healthy Conner will be a force. So the question remains: How will the coaching staff spell Conner? With Rachid Ibrahim out for the season, they will have to trust a very young group of backups. But despite the inexperience, Chaney isn’t worried. “If they earn the right to get reps on the field and play in the game, they will,” Chaney said. Sophomore Chris James has already earned his time, as he saw reps as a backup last year. James scored four times and averaged five yards on 87 carries. Behind James are two first-year players — Qadree Ollison, a redshirt freshman, and Darrin Hall, a true freshman. Hall was reluctant to admit he had low expectations for potential playing time. “I didn’t think I was going to redshirt, but I didn’t think I was going to play a lot. I just came in here working, trying to earn a spot somewhere,” Hall said. Hall put in the work, and Powell was emphatic about the freshman’s chance of seeing the field. “Darrin will play this year,” Powell said. With four talented backs, Chaney will not stray from his options in the running game. At his last school, Arkansas, Chaney ran a committee approach, with backs Jonathan Williams and Alex Collins each topping 1,000 yards rushing. However, he will not necessarily base his approach off of his time there. “Arkansas is a different world, a different team,” Chaney said. He added that he felt comfortable with a three-man rotation at running back and has even used four when injuries have intervened. New offensive coordinator Jim Chaney will have plenty of tools to work with out of the backfield. 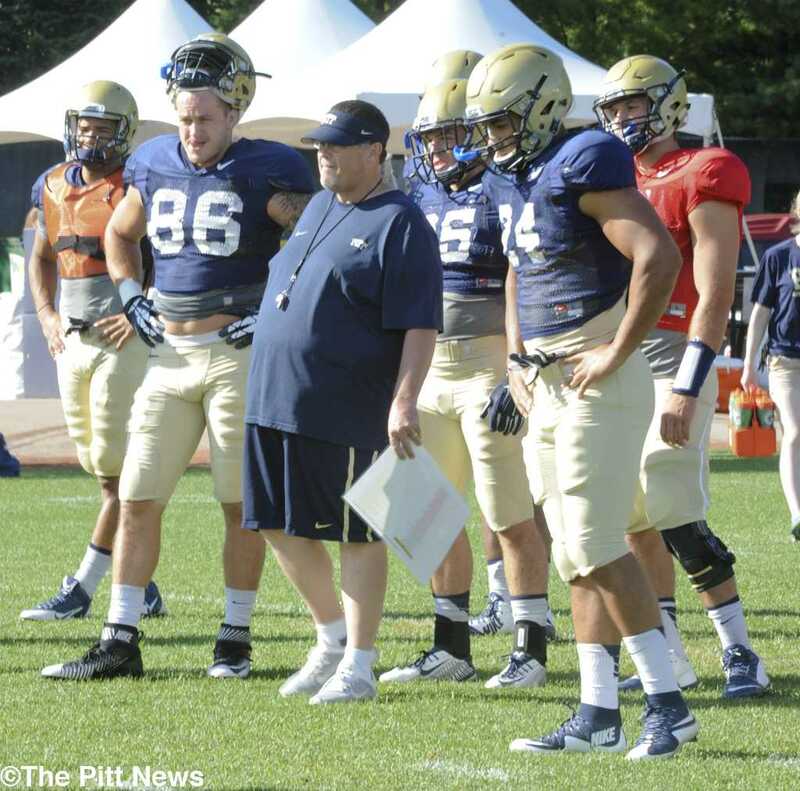 But unlike last year, when Pitt fans would see Isaac Bennett brought out for passing situations, the Pitt coaching staff has no plan to pigeonhole players into roles. This means that the younger players need to learn quickly how to handle anything from goal line to third-and-long. But with players like Conner on the team, the freshmen have a security blanket. Not that cutbacks will be too important to this group of players. Powell doesn’t see many differences between his running backs. They all share a common strength, and he wants to utilize it. And that means that opposing defenses will be in for a walloping. “We expect them to be clavicle busters,” Powell said.